My Japanese skills are improving rapidly since my move to Japan, and I’ve achieved a state of relative (dis)comfort with basic functions like travel, shopping, restaurants, and paying basic bills. In other areas, I can often “keyword spot” and intuit the portions of a conversation I don’t know, to at least achieve an acceptable result. However, it doesn’t take much to remind me that, in the immortal words of Robert Frost, I have “miles to go before I sleep” in terms of linguistic fluency. I’m spending this week in Tokyo to catch up on some writing obligations while planning the next round of my 100 Summits climbs. Around 2pm the doorbell rang. 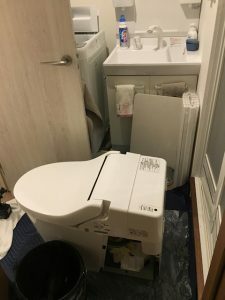 I opened it to find a serviceman, who informed me (in Japanese) that they were ______ , and that the water would be off for a while, so please don’t use the toilet until later. (Here, and elsewhere in this post, the blanks represent the Japanese I did not understand.) I confirmed that I understood, and he departed. A couple of hours later, the serviceman returned. “_______,” he said. (This time, I got nothing.) Despite my lack of comprehension, I could tell he wanted to come inside, so I stepped back from the door and invited him in. He inspected the toilet (no big surprise, given our earlier exchange), thanked me, and left. They thanked me and departed, only to return again ten minutes later for a second round of toilet viewing, this time with photography. By now, I was thoroughly confused. However, my limited Japanese offered no shot at real understanding, so I did what I normally do in Japan: I went along with the program, smiled, and asked “daijobu desu ka?” (Is it ok?). They confirmed, “daijobu desu” – which I accepted as confirmation that, at least for the moment, I was neither about to be evicted nor expected to pay for anything, in which case all was well with the world. I did, however, wonder what made my toilet so intriguing. 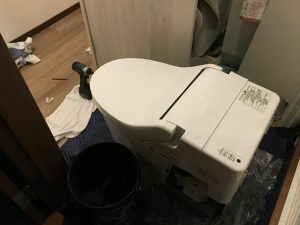 An hour later I received a call from the landlord’s management company–entirely in Japanese–and this time, I couldn’t simply answer in the affirmative and hope the issue resolved on its own. (A serviceman, yes. The landlord, no.) When I told the woman I did not speak much Japanese, and asked whether she could speak English, she demurred, said goodbye, and hung up. At which point, I grew concerned. Fortunately, the management company called back a few minutes later–this time, with an English-speaking representative who told me there was a water leak in the apartment below mine and asking me if it would be convenient for a repairman to come to my house within the hour. I agreed, and hung up with a feeling of relief even greater than what I’m sure the downstairs neighbors will feel when my toilet no longer leaks into their living space. The repairman and his assistant arrived on schedule, disassembled my toilet, and just departed–for parts unknown–after letting me know that he’ll be back in 30 minutes. Here’s hoping the toilet fix resolves the downstairs issue without creating a new one on this end. Because while I’m glad to have resolved the Great Toilet Parade Mystery of 2018, I’d hate to have solved problem #1 only to end up having problems with #2. ← Mt. Tomuraushi – and Pikachu! Of course, now I have to know the rest of the story! Are things flushing in the Spann household yet? Fortunately, YES! We had flushing again the same night, thank goodness!